2.4. "Which one should I use?" These two monitors are an extremely common source of people needing help, so this section is dedicated to telling you how to connect to these monitors at 120+ Hz. Also please note that the BenQ "XL2411" and "XL2411Z" are just two different names for the same product. If you are using a laptop that only has HDMI output, DO NOT BUY THESE MONITORS. There is no way of getting more than 60 Hz on these monitors from an HDMI output. How can I connect to the GN246HL / XL2411Z at 120+ Hz? The only way to get 144 Hz on the Acer GN246HL or BenQ XL2411Z is by connecting to the monitor's DVI port with a Dual-Link DVI connection. The monitor's VGA and HDMI ports are limited to around 60 Hz at 1080p. The DVI connection must be DUAL-LINK, otherwise you will be limited to 60 Hz. All HDMI to Dual-Link DVI adapters are fake, and will be limited to 60 Hz at 1080p because they are really only Single-Link DVI adapters. No exceptions. You cannot use HDMI to DVI adapters to get 144 Hz on these monitors. Most DisplayPort to Dual-Link DVI adapters are fake, and will be limited to 60 Hz at 1080p because they are really only Single-Link DVI adapters. You cannot use normal cheap DP to DVI adapters to get 144 Hz on these monitors, you need much more expensive specialized adapters for this purpose (keep reading for details and specific recommendations). Some Dual-Link DVI-to-DVI cables are fake, and will be limited to 60 Hz at 1080p because they are really only Single-Link DVI cables. Use the cable that comes included with the monitor. If you need a replacement cable, then look for a DVI cable that lists support for 9.9 Gbit/s bandwidth, or 330 MHz TMDS/pixel clock, or 2560×1440 or 2560×1600 support. Do NOT try to identify "Dual-Link" cables by counting the number of pins on the connector, just because it has 24+1 pins does not mean it is a genuine Dual-Link cable. So what options exist for getting a true Dual-Link DVI connection? What if my computer doesn't have a DVI port or a DisplayPort port? If you have a laptop that only has HDMI, then it is impossible to connect to these monitors at more than 60 Hz. You need to return the monitor and buy one that supports 120+ Hz over HDMI. A list of such monitors can be found at the bottom of this guide (Section 7.1). What kind of DisplayPort adapters can I use? Getting 1080p 144 Hz on a DP to DVI connection requires specialized adapters. You cannot use normal $10 DP to DVI adapters. You need to use a DUAL-LINK ACTIVE ADAPTER, which usually costs around $80–$100 USD. Do you have any suggestions for DisplayPort to DVI adapters? That adapter is really expensive, are there any other options? What if my laptop only has HDMI output? Can I use a chain of adapters from HDMI to DP and then DP to DL-DVI? The term "adapter" includes both adapter cables and adapter dongles. Internally they are the same thing, so all information in this guide applies equally to both types of adapter. An adapter cable is functionally identical to an adapter dongle with a cable permanently attached to it. The convention for discussing adapters is "<source> to <display>". This means a "DisplayPort to HDMI adapter" is a device that connects a DP computer to an HDMI display, not the other way around. Most adapters only work in one direction, so having backwards terminology can potentially result in buying the wrong item. However, this can usually be avoided by simply reading the product description. The video ports on your computer/graphics card are called output ports because the video signal originates from here and is sent out to the monitor/display. Any DP cable will work for up to 1080p 144 Hz or 1440p 85 Hz. For higher formats, you should get a DP cable certified for HBR2 speeds (often improperly advertised as a "version 1.2 cable"). HBR2 speed supports up to 240 Hz at 1080p or 165 Hz at 1440p. For even higher formats, such as 4K 120 Hz, you should get a DP cable certified for HBR3 speeds (often improperly advertised as a "version 1.3 cable" or "version 1.4 cable"). HBR3 speed supports up to 120 Hz at 4K or 240 Hz at 1440p. To obtain full performance, you need a DP output port on your computer. You just need a Dual-Link DVI cable will work. These are also called "Dual-Link DVI-D" cables (same thing). Single‑Link DVI cables will be limited to around 60 Hz at 1080p. If your computer does not have a DL-DVI output port, it is difficult to get high refresh rates through an adapter. HDMI can be used for high refresh rates on some monitors. It depends on the maximum HDMI bandwidth supported by the monitor. This is configured by the manufacturer and is not dictated by the "HDMI version". For example, some "HDMI 1.4" monitors are limited to 60 Hz at 1080p over HDMI, like the ASUS VG248QE and Acer GN246HL. Other "HDMI 1.4" monitors max out at 1080p 120 Hz, like the Samsung C24FG73. 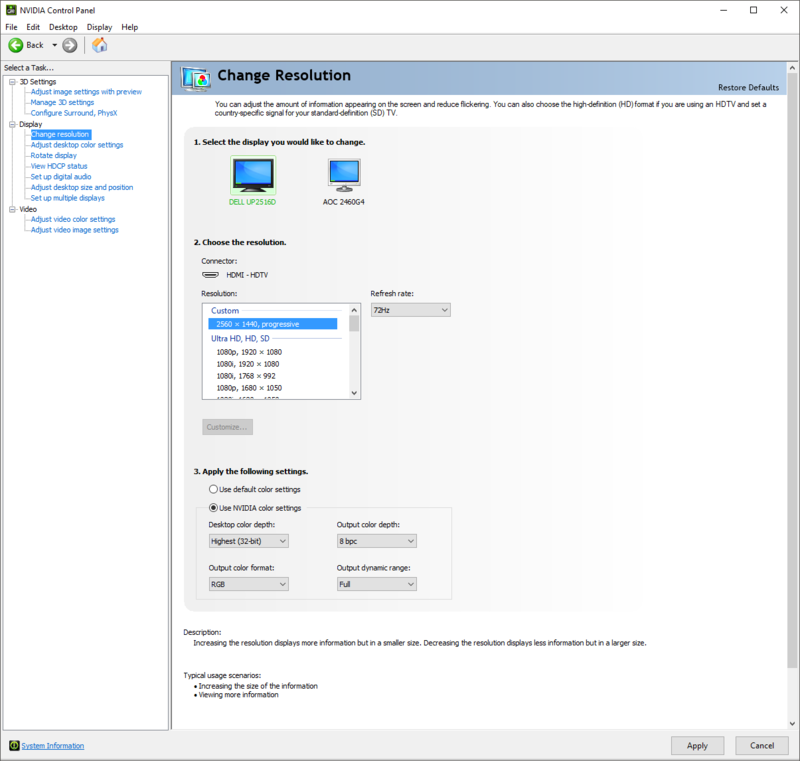 Other "HDMI 1.4" monitors support up to 1080p 144 Hz over HDMI. Any certified High Speed HDMI cable should work up to 144 Hz at 1080p (often improperly advertised as a "version 1.3 cable" or "version 1.4 cable"). If your computer does not have an HDMI output port available, there are many adapters readily available which can adapt to HDMI at high refresh rates. You can use a DP to HDMI adapter, but be warned that not all DP to HDMI adapters support high refresh rates, some are limited to 60 Hz at 1080p. You need a Type 2 passive adapter or an active adapter to get high refresh rates with a DP to HDMI adapter. See Section 5.5.1. There is no visual difference between DVI, HDMI, and DisplayPort. They only differ in maximum capability. For example, at 1080p 144 Hz, DVI and DisplayPort can both do it, so they are both equally good options. At 1440p 144 Hz, DisplayPort can do it and DVI can't, so DisplayPort is better than DVI in that situation. That is how it works. Each interface either can or can't do it, depending on the desired format. All the options that can do it are just as good as each other. Use whichever one is most convenient. It should also be noted that DVI does not support inline audio or HDR. If you care about either of those, then you need to use HDMI or DisplayPort. A DP port may have either a full-size DisplayPort (DP) connector or a Mini DisplayPort (mDP) connector, shown above. There is no difference between them, other than the physical shape of the connector. DisplayPort cables and ports have the same capability whether they use a full-size or a mini connector. They are interchangeable using a simple adapter, which does not affect the capabilities in any way. Note: This is about versions of the DisplayPort Standard in general. It is not about DP cables. DisplayPort cables are not classified by a "version number". See Section 3.3 for information about selecting a DisplayPort cable. There are several different versions of the DisplayPort standard. Newer versions introduce support for faster speeds, which are necessary for high-bandwidth formats such as 1440p 144 Hz or 4K 60 Hz. For up to 1080p 144 Hz, no considerations need to be made. All versions of DisplayPort can support up to 1080p 144 Hz. To operate at the higher speeds, the hardware in both the monitor and the source device must BOTH support the required version. Keep in mind that the "DisplayPort version" is NOT an absolute description of a device's capabilities. Individual devices may have their own limitations. For example, NVIDIA Kepler graphics cards (GTX 600 and 700 series) have "DisplayPort 1.2" ports, but they are limited to only 75% of the maximum bandwidth allowed by the DP 1.2 standard. The basic speed, HBR, is enough for up to 144 Hz at 1080p. Higher resolutions and refresh rates require higher transmission speeds. To operate at a higher speed, the devices on both ends must each support that mode (HBR2 or HBR3), and the DP cable must also be rated to handle that speed. HBR speed is 10.8 Gbit/s. This mode was defined in DisplayPort version 1.0. Nearly all DisplayPort devices support the full speed of this mode. Some exceptions include older generation (2011-era) Intel integrated graphics such as Intel HD 3000, which was limited to around 6.75 Gbit/s over DisplayPort. This is not a concern with modern GPUs. Any DisplayPort cable should handle HBR speed. Even cheap knock-off cables will be capable of this speed. HBR2 speed is 21.6 Gbit/s. This mode was introduced in DisplayPort version 1.2. Most DisplayPort 1.2 GPUs are capable of the full HBR2 speed. There are some exceptions however; NVIDIA Kepler graphics cards (GTX 600 and 700 series) are limited to only 75% of the full data rate. Therefore, these graphics cards are limited to 200 Hz at 1080p or 120 Hz at 1440p. HBR2 speed also requires a DisplayPort cable which is properly rated for this speed. Not all DisplayPort cables will handle HBR2 speed, particularly longer cables (> 3 meters). Look for cables that have a VESA certification for HBR2 speed (21.6 Gbit/s). Sometimes these will also be advertised as "DisplayPort version 1.2 cables", although "versions" are not a technically proper way of classifying cables. HBR3 speed is 32.4 Gbit/s. This mode was introduced in DisplayPort version 1.3. 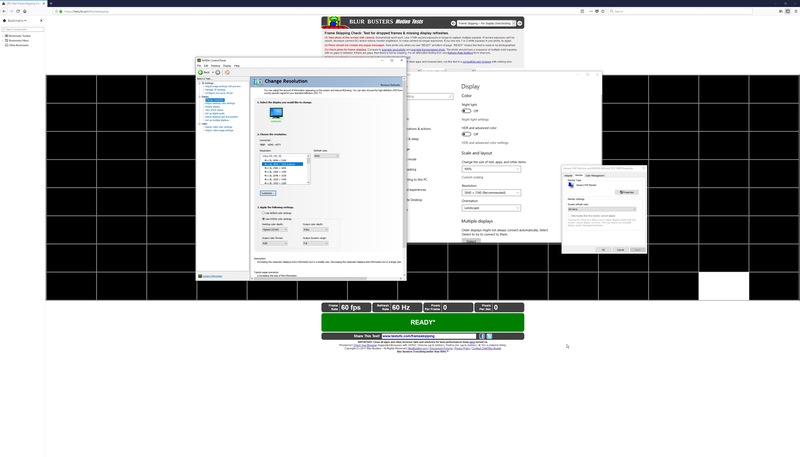 All DisplayPort 1.3 and 1.4 GPUs so far support full HBR3 speed. HBR3 speed also requires a DisplayPort cable which is properly rated for this speed. Not all DisplayPort cables will handle HBR3 speed. Look for cables that have a VESA certification for HBR3 speed (32.4 Gbit/s), also known as a "DP8K" certification. Sometimes these will also be advertised as "DisplayPort 1.3 cables" or "DisplayPort 1.4 cables", although "versions" are not a technically proper way of classifying cables. All DisplayPort devices are compatible with each other regardless of version, and all DisplayPort cables are compatible with all devices, regardless of the speed rating of the cable. Speeds and features will be limited to the lowest version. 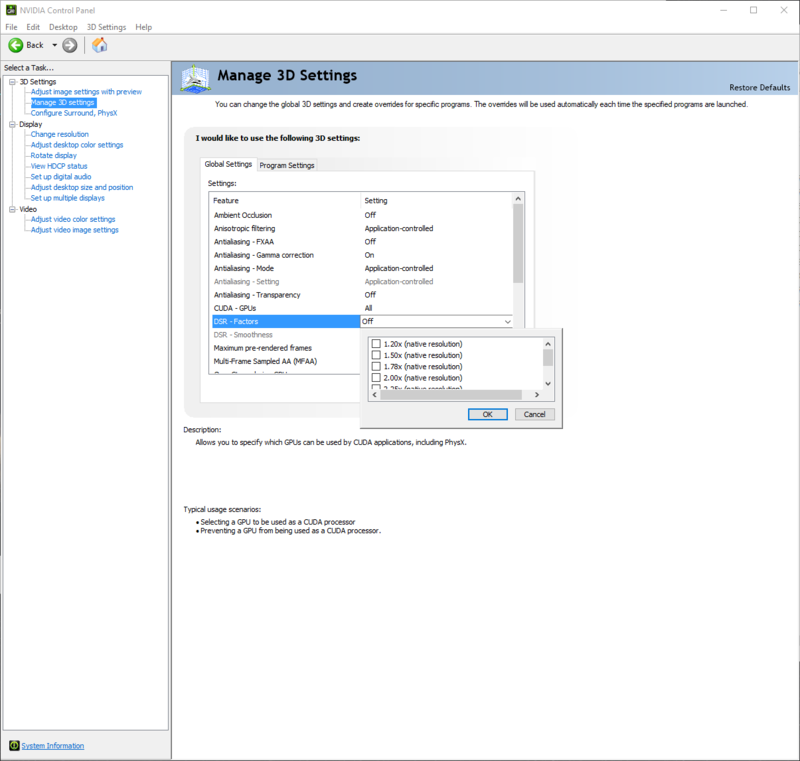 For example, if your monitor supports DisplayPort 1.4, but your graphics card only has DP 1.2, then the connection will be limited to the speed and features of DP 1.2 only. Likewise, if your DP cable is only rated for HBR2 speed, then the connection will be limited to that speed. "What DisplayPort cable do I need?" This depends only on the resolution/refresh rate combination you wish to run. DisplayPort cables do not affect feature support. All features, such as G-Sync/FreeSync, HDR, audio, etc. will work with any DP cable. You do not need any special DP cable to use certain features. For up to 1080p 144 Hz, any DisplayPort cable will work. For up to 1440p 165 Hz, or 1080p 240 Hz, or 4K 75 Hz, you should get a DisplayPort cable certified for HBR2 speed. These are sometimes advertised as "version 1.2" cables, although this notation is improper. DP cables are not rated by "version numbers". For up to 4K 120/144 Hz, you should get a DisplayPort cable certified for HBR3 speed. These are sometimes advertised as "version 1.3" or "version 1.4" cables, although again that notation is improper. All DisplayPort cables are compatible with all DisplayPort devices. DisplayPort cables do not affect feature support. All DisplayPort features, including inline audio, FreeSync/G-Sync, HDR, DSC, etc. will work on any DisplayPort cable. However, low quality cables may prevent you from reaching high resolutions or refresh rates. Generally speaking, any DP cable can handle up to 1080p 144 Hz, but higher formats like 1440p 144 Hz may require more careful selection, as described below. DisplayPort cables are not all the same; not all DisplayPort cables can handle high speeds. You may hear people tell you "DisplayPort cables are all the same" or things like that, but this is not correct. DisplayPort cables are classified by a maximum speed rating. A DisplayPort connection only operates at a few specifically defined speeds. If the cable is too poor quality to maintain a stable data stream, the connection will fall back to a lower speed level. Users will often encounter this behavior with 1440p 144+ Hz monitors, where people will discover their monitor is limited to 1440p 85 Hz. This is because the cable was too poor quality to maintain a stable HBR2-speed connection, so the speed was reduced back to standard HBR level, which has a maximum of 85 Hz at 1440p. This can be resolved by replacing the cable with one that is properly rated for HBR2 speed. The details of these ratings (such as maximum resolution/refresh rate combinations) can be found in Section 3.2.2. DisplayPort cables are classified by a maximum speed rating (either HBR, HBR2, or HBR3, as described in Section 3.3.2). DisplayPort cables are NOT classified by "version number". Cables only affect the maximum speed of the connection. As such, cables are rated by the maximum speed they can handle. Since the maximum speed does not change with every new DP version, it does not make sense to use version numbers for classifying cables. For example, DisplayPort versions 1.3 and 1.4 both have the same maximum speed, which is HBR3 speed (32.4 Gbit/s). Therefore, as long as a DP cable can handle HBR3 speeds, it will be sufficient for the full capabilities of both versions. 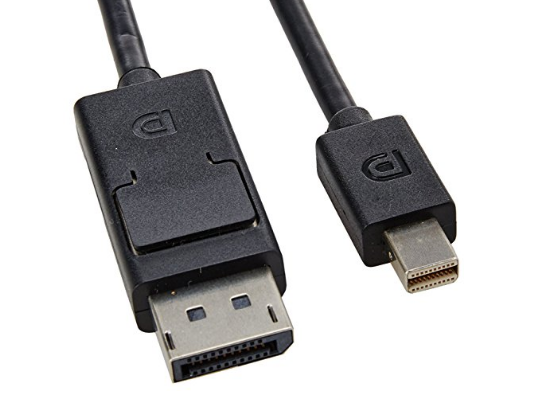 There are no separate "DisplayPort 1.3 cables" or "DisplayPort 1.4 cables", and referring to an HBR3 cable as a "DP 1.4 cable" gives the false impression that there is also a separate "DP 1.3 cable", when there really isn't. In addition, using version numbers for cables gives false impressions about feature support. For example, calling an HBR cable a "DP 1.1 cable" might imply to some people that features from higher versions like HDR from DP 1.4 will not work on the cable, even though this is not the case. All DisplayPort features of any version will work on any cable. The only thing a cable with a low speed rating will do is limit the speed of the connection, which limits the maximum refresh rate and resolution. All other features, such as FreeSync, HDR, audio, etc. do NOT depend on the cable's speed rating in any way. All DisplayPort features work on any DisplayPort cable. You do not need any kind of special DisplayPort cable for FreeSync/G-Sync to work, or for inline audio or HDR, or anything else. All features work on all cables. The only thing the DisplayPort cable affects is the maximum speed of the connection, which dictates the maximum resolution/refresh rate that will be available. Nothing else is affected by the choice of DisplayPort cable. Please be aware that in the past, some manufacturers have made DisplayPort cables with improper pin configurations which were in violation of the DP standard and can potentially damage devices by causing a short circuit. Since they did not bother to submit their designs for certification, these mistakes were not caught until they were widely distributed. These products were not recalled as far as I'm aware, so if you buy off-brand non-certified cables, you run the risk of buying these incorrectly-designed DisplayPort cables. It is recommended to only buy DisplayPort cables that have been certified by VESA. You can use an HDMI to DisplayPort active adapter (not to be confused with a "DisplayPort to HDMI adapter"—See Section 1.1!). Currently, there are adapters available for up to 120 Hz at 1080p / 60 Hz at 1440p / 30 Hz at 4K. No, there are no HDMI to DP adapters that support 144 Hz at 1080p, or >60 Hz at 1440p or 4K (last checked: March 2019). There are a few HDMI 2.0 to DisplayPort adapters that support 4K 60 Hz, but they are extremely expensive and can only operate in a few specific formats (4K 60 Hz, 1080p 60 Hz, etc.). They do not appear to work at >60 Hz at any resolution (even 1080p), though I have not tested one myself. I have tested this adapter to work up to 120 Hz at 1920 × 1080. Please note this is not the same thing as a "DisplayPort to HDMI adapter". Refer to Section 1.1. The inexpensive commonplace adapters and cables you find are DisplayPort to HDMI adapters, not HDMI to DisplayPort. They will not work for connecting to a DisplayPort display. DVI to DisplayPort adapters are very uncommon, and there are currently none that support more than 1080p 60 Hz (last checked: March 2019). Therefore, there is no way to connect a DVI computer to a DisplayPort display at 120+ Hz. Please note this is not the same thing as a "DisplayPort to DVI adapter". Refer to Section 1.1. The inexpensive commonplace adapters and cables you find are DisplayPort to DVI adapters, not DVI to DisplayPort. They will not work for connecting to a DisplayPort display. If you have a video-capable USB Type‑C port, you can use a USB‑C to DisplayPort adapter. This is equivalent to a native DisplayPort connection. 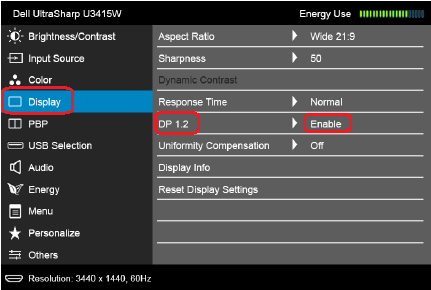 Current devices support up to DisplayPort 1.2, so up to 240 Hz at 1080p or 165 Hz at 1440p. USB‑C adapters also work in Thunderbolt 3 ports. These adapters will only work if the USB‑C port has video output capability. Not all USB‑C ports have this capability, it is an optional feature. You just need a Dual‑Link DVI cable and you're good to go, up to 144 Hz at 1080p. DVI port type (DVI-D, DVI-I, etc.) doesn't make any difference. The basic DVI configuration is called "Single‑Link DVI-D", which only supports DVI signals up to 60 Hz at 1080p, and does not support passive VGA adapters. The DVI standard has two optional features that a DVI port may be equipped with. The first optional feature is the ability to send higher-bandwidth digital signals. This allows the DVI port to support up to 144 Hz at 1080p. Support for this feature is denoted by the name "Dual‑Link" instead of "Single‑Link". The second optional feature is the ability to send VGA signals. This allows the port to connect to VGA monitors with a simple passive adapter. A DVI port with this feature can be considered a "DVI + VGA combo port". Support for this feature is denoted by the name "DVI-I" instead of "DVI-D". DVI ports may support both of these features (i.e. "Dual‑Link DVI-I"), or only one, or neither. Sometimes, retailers or manufacturers may not specify the full name of the DVI port. It is common to see terms like "Dual‑Link DVI port" (without specifying DVI-D or DVI-I), or sometimes just "DVI port" without specifying any part of the feature set. These terms do not represent additional variations of DVI (like a "plain DVI" instead of DVI-D or DVI-I; there is no such thing), it only means the retailer/manufacturer is not specifying which variation it is. 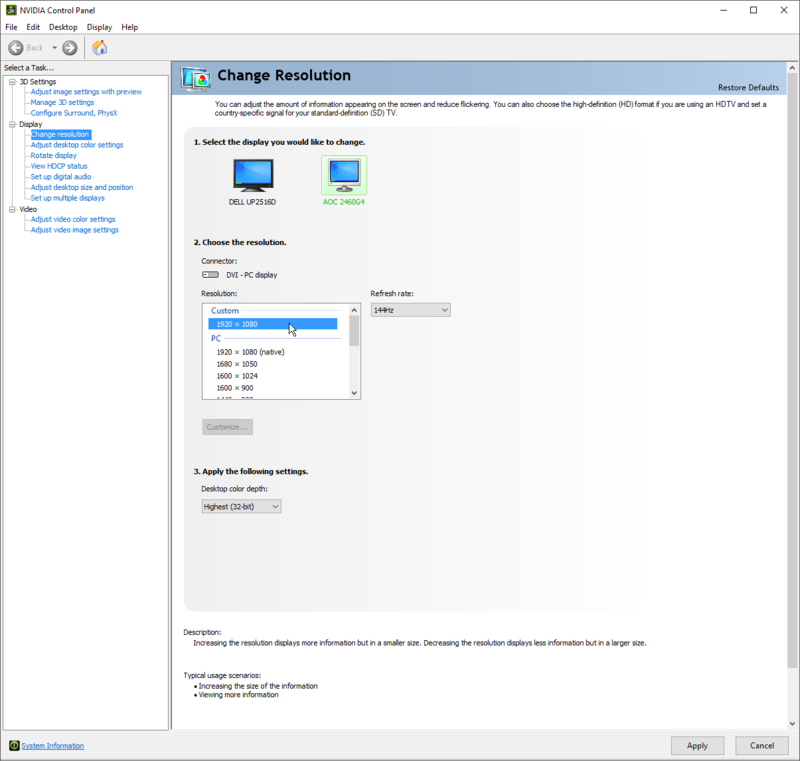 It usually does not matter if they specify the exact DVI configuration, as certain assumptions can be made about Dual‑Link support (see Section 4.2), and VGA support (DVI-I vs. DVI-D) is irrelevant for connecting to 120+ Hz displays. You may hear people advise you to watch out for "DVI-A" as another DVI variant that only supports VGA signals, because they saw it on the Wikipedia diagram. This "DVI-A" connector is not a part of the DVI standard. It is an informal name given to an unofficial pin configuration found on some DVI-to-VGA passive adapters, where manufacturers occasionally leave off all unnecessary pins on the DVI side of the adapter, leaving only the ones needed for the VGA connection. Advice like "make sure you aren't using a DVI-A cable" or "make sure your monitor's DVI input supports digital signals, it might only be a DVI-A port" is complete nonsense. The "DVI-A" pin configuration has only ever been used on DVI-VGA passive adapters, where it's already predetermined that the other pins aren't going to be used. There are no "DVI-A ports" or "DVI-A cables". There are no situations in which it matters that the DVI-A pin configuration is used. You can therefore ignore its existence, and just pretend it says "DVI-I" whenever you see it mentioned. People will often give you this diagram from Wikipedia, and tell you to just examine the pin configuration on the port/cable to determine if it's Single‑Link or Dual‑Link. This is generally incorrect. Single‑Link DVI ports do not have missing center pinholes like the Wikipedia diagram might suggest. Single‑Link DVI and Dual‑Link DVI ports cannot be distinguished from each other by eye. The only visually identifiable feature on a DVI port is the ability to support VGA adapters, indicated by the four extra pins on the side (right-hand image). Single‑Link DVI cable connectors only sometimes have missing center pins. If a cable/adapter has missing pins, then it is definitely a Single‑Link cable, but if it has a full complement of pins then it could be either a Single‑Link or Dual‑Link cable. Dual‑Link DVI cables and adapters cannot be reliably distinguished by eye. 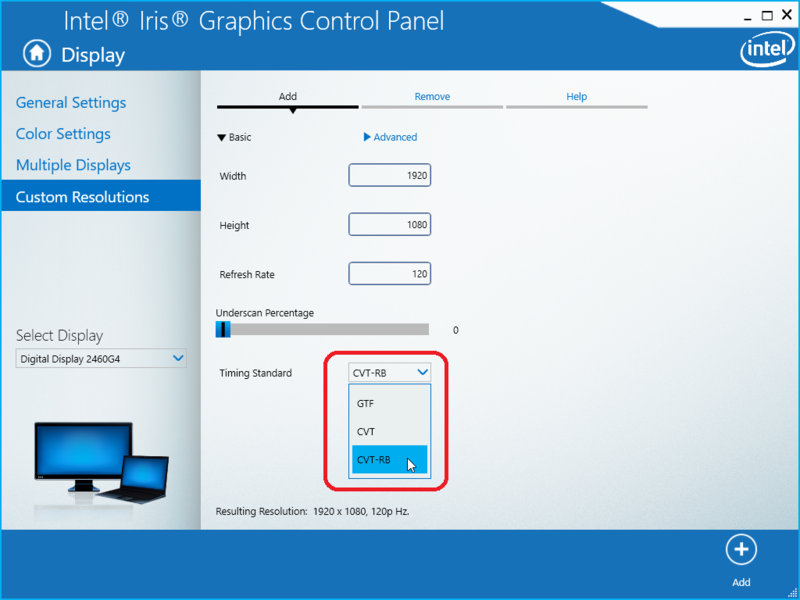 DVI ports on graphics cards and 120+ Hz monitors always support Dual‑Link DVI, and do not need to be checked. DVI ports/connectors on DisplayPort or HDMI passive adapters/cables are always Single‑Link DVI. Most passive DVI adapters are falsely advertised as "Dual‑Link DVI" adapters; don't be fooled, even if it says Dual‑Link right in the product title, they are not afraid to lie to your face. If it’s a passive adapter, it’s physically impossible for it to support Dual‑Link DVI. If a DVI cable or adapter only claims to support a maximum of 1920 × 1080 or 1920 × 1200, then it is a Single‑Link DVI cable/adapter. If a DVI cable claims to support 2560 × 1440 or higher, then it is a Dual‑Link DVI cable. DVI-to-DVI cables only come in two types: Single‑Link DVI and Dual‑Link DVI. Both of these cables can be used to successfully connect any DVI port to any other DVI port, but a Dual‑Link DVI cable is required for more than 60 Hz at 1080p or more than 40 Hz at 1440p. These cables are used for both DVI-D and DVI-I ports. There are not separate cable types for each type of port. These cables are also sometimes referred to as "Single‑Link DVI-D" and "Dual‑Link DVI-D" cables. The "-D" is typically omitted because it is superfluous and misleading. It suggests that the cables are only for DVI-D ports, when in fact the same cables are used for both DVI-D and DVI-I ports. A Dual‑Link DVI cable can be used to connect any DVI port to any other DVI port at maximum capability. This is the recommended cable for all situations. "Can I connect a DVI-I port to a DVI-D port?" Yes. A "DVI-I" port is just a DVI-D port that also supports VGA adapters. Any DVI-D adapter or cable will function identically in a DVI-I port as it would in a DVI-D port. You do not need a "DVI-I to DVI-D" cable or any other kind of special adapter. "Can I use a DVI-D cable in a DVI-I port?" Yes. So-called "DVI-D" cables are used for both DVI-D and DVI-I ports. There are no "DVI-I cables". "Can a Dual‑Link DVI cable be used in a Single‑Link DVI port?" Yes. You may be told by others that Single‑Link DVI ports have the center pinholes blocked and won't accept Dual‑Link cables. This is incorrect. Single‑Link DVI ports do not have the center pinholes blocked. Single‑Link DVI cables may have the center pins missing, but this does not affect compatibility, and not all Single‑Link cables are constructed this way. The only way to connect to a DVI monitor at 120+ Hz without a DVI output port is by using a DisplayPort to Dual‑Link DVI active adapter. While you can easily find cheap DP to DVI adapters and cables, these products are all passive adapters, which means they are Single‑Link only, and will be limited to 60 Hz at 1080p. Be aware that these Single‑Link adapters are commonly advertised as "Dual‑Link" and may appear to have a full set of Dual‑Link pins on the connector, but they are fake. Any passive DP to DVI adapter is automatically Single‑Link only. A Dual‑Link DVI active adapter is required for more than 60 Hz at 1080p. Note that not just any active adapter will work, it must be a Dual‑Link adapter. Active adapters that are only Single‑Link do exist. There are no adapters that can connect an HDMI computer to a DVI monitor at more than 60 Hz at 1080p. Standard DVI-HDMI passive adapters are Single‑Link only, and will be limited to 60 Hz at 1080p. These Single‑Link adapters are commonly advertised as "Dual‑Link" and may appear to have a full set of Dual‑Link pins on the connector, but do not be fooled, they are fake. Any passive DVI-HDMI adapter is automatically Single‑Link only. There are no adapters that can connect a USB‑C computer to a DVI monitor at more than 60 Hz at 1080p. All currently available adapters are Single‑Link only. It is possible to support high refresh rates over HDMI. 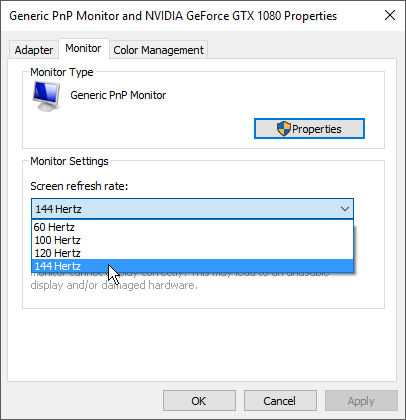 1080p 144 Hz can be implemented as of HDMI 1.3 and later. I demonstrate high refresh rates over HDMI 1.4 here and here. However, this capability is optional. Display manufacturers are not required to support it. If the manufacturer doesn't specify, then there is no way to know if a monitor supports 120+ Hz over HDMI except by testing it. A list of monitors known to support 120+ Hz over HDMI can be found at the end of this guide (see Section 7.1). A lot of people will probably tell you something about HDMI versions, like "it'll work as long as it has HDMI 1.3 or higher" or "you need HDMI 2.0 or higher", or "that monitor has HDMI 1.4a, so it should support up to 120 Hz" or something like that. These things are not correct. You cannot tell whether a monitor supports 1080p 120+ Hz over HDMI just from the HDMI version. It is technically possible to implement 1080p 144 Hz as of HDMI 1.3 and later, but since it is optional, you cannot tell anything from the version number. Some HDMI 1.4 monitors support 144 Hz over HDMI, while some HDMI 1.4 monitors are limited to 60 Hz over HDMI, and others only go up to 120 Hz but not 144. The HDMI version number doesn't tell you anything about 1080p 120+ Hz support. 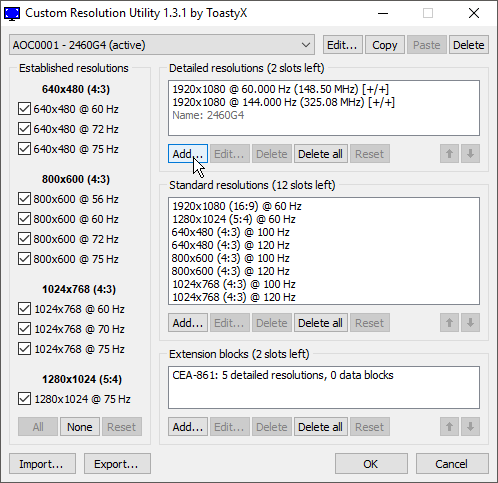 For 1440p, full HDMI 2.0 support is required for 120+ Hz. Please note that the monitor must also support HDMI 2.0, not just your graphics card/laptop. Many 1440p 144 Hz monitors only support HDMI 1.4 and will be limited to 60 Hz over HDMI, including ALL G-Sync monitors. Do not assume that the monitor has HDMI 2.0 just because it is a 1440p 144 Hz display. Many popular monitors, such as the ASUS VG248QE, BenQ XL2411Z, and Acer GN246HL are limited to 60 Hz over HDMI. This is just a limitation of those monitors, but people have misinterpreted it as a limitation of the HDMI standard. In actual fact, the HDMI 1.4 standard does allow 120+ Hz at 1080p, manufacturers simply chose not to implement that capability in those particular monitors (and in many others). But not all monitors have this limitation. A list of monitors known to support 120+ Hz over HDMI can be found at the end of this guide (see Section 7.1). The GamersNexus article is wrong, an unfortunate result of Google research. The "only for 3D" thing is just a made-up answer that spread around on forums and reddit threads a few years ago. It was just a hypothesis (an incorrect one, we now know), but it became popular because it couldn’t be "disproved" (the full HDMI 1.4 specification was confidential), and people were desperate to come up with an explanation for the hordes of people confused about why their VG248QE was only getting 60 Hz with HDMI. Eventually it was repeated often enough that it just became accepted as fact despite no actual attempt to verify it, especially when publications like GN started helping to spread it. There have been many 120/144 Hz monitors limited to 60 Hz over HDMI, and people have been making up explanations for this for a long time, the "only for 3D" hypothesis is just the most recent (but hopefully last) example. People used to say "HDMI 1.4 doesn't have enough bandwidth for >60 Hz"
This of course can be easily disproved with simple math, but it’s not even necessary, all you need is basic logic. HDMI has always been capable of at least 1080p 60 Hz, even in version 1.0. Then the maximum bandwidth was increased by over double in HDMI 1.3. It can't still only have enough bandwidth for 60 Hz at 1080p. Then people started saying "well then, HDMI 1.4 must just have a flat 60 Hz limit, regardless of bandwidth"
"Well then, it must be that HDMI 1.4 just has a 60 Hz limit regardless of bandwidth, but only for 1080p!" "Well then, it must be that HDMI 1.4 has a 60 Hz limit regardless of bandwidth, only for 1080p, but not if you're using 3D!" The "2D" section of the HDMI 1.4a specification was confidential and couldn’t be checked, but people decided to bet that 1080p 120 Hz wouldn’t be listed as a supported format in that section, only in the 3D section that had been revealed. They bet wrong. Actually, it’s been listed in that section since HDMI 1.4, not even just 1.4a. (§6.3.2, p. 108). So, the whole "only for 3D" thing was just a hypothesis based on the assumption "I bet 1080p 120 Hz isn’t listed in the 2D section of the HDMI 1.4 spec". But it is. The whole thing is a complete fiction. 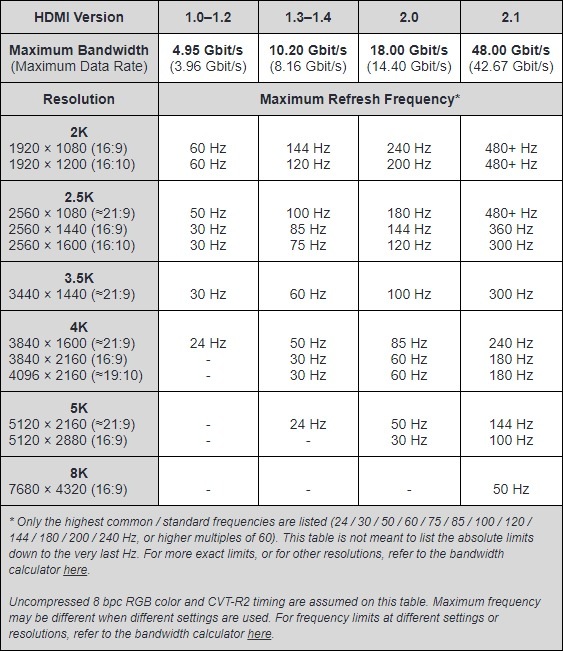 There is no "3D only" limitation on 120+ Hz refresh rates anywhere in any version of the HDMI specification. The real explanation, as mentioned, is that HDMI 1.4 does allow UP TO 144 Hz at 1080p, but it doesn't require this capability to be implemented. It is optional. And most manufacturers have opted not to implement it, presumably for cost-saving reasons. 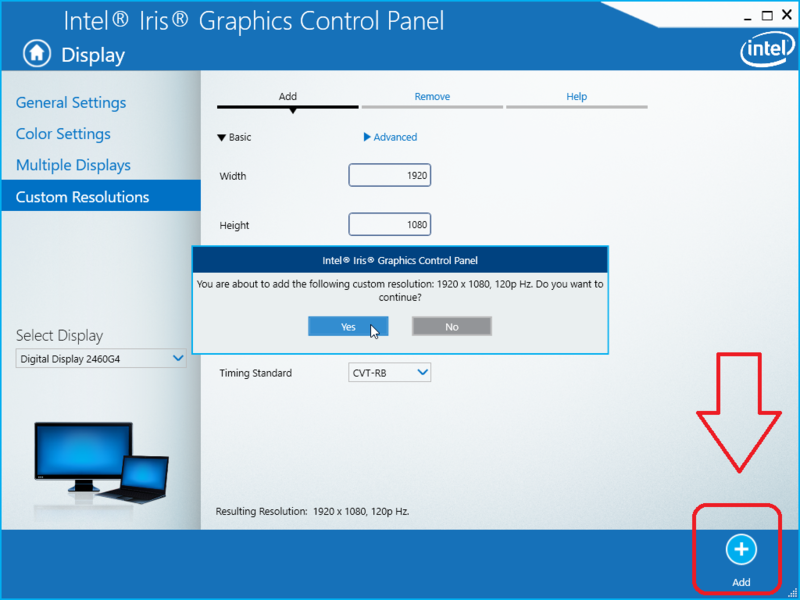 The 60 Hz HDMI limit on various monitors is not in any way a limitation imposed by the HDMI standard, it is the monitor manufacturer's choice. 5.1.3.1. "Alright, so HDMI 1.4 lists support for 1080p 120 Hz. But where does 'HDMI 1.3+ supports up to 144 Hz' come from?" I only mention the fact that 1080p 120 Hz is listed in the HDMI 1.4 specification because it's an easy way to show without any doubt that these supposed "60 Hz limit at 1080p" and "only for 3D" limitations are totally made up, and are directly contradicted in black and white in the HDMI specification itself. But actually, that list of supported formats isn’t all that important. Back in HDMI 1.0 and 1.1, HDMI only allowed some specific home theater formats, but from version 1.2 onward, HDMI allows any arbitrary format, as long as it falls within the bandwidth limit. It’s literally the first sentence of the video section of the HDMI specification. HDMI allows any video timing format to be transmitted and displayed. To maximize interoperability between products, common DTV formats have been defined. These video format timings define the pixel and line counts and timing, synchronization pulse position and duration, and whether the format is interlaced or progressive. HDMI also allows vendor-specific formats to be used. 5.1.3.2. "If HDMI 1.2+ allows any arbitrary format, what is the list of supported formats for?" The purpose of the "supported formats" list in §6.3.2 isn’t to dictate which formats are or aren’t allowed. It’s a list of formats that have standardized timing parameters defined already, to promote interoperability between products. Timing intervals (or blanking intervals) are short pauses between each line and frame of video, during which HDMI sends audio data and control signals. The durations of these intervals are adjustable, and are negotiated by the display and source upon connection. To ensure basic compatibility, the HDMI specification establishes standardized timing parameters for certain common formats, listed in that section. 5.1.3.3. Why is 1080p 120 Hz listed as a supported format in HDMI 1.4, but not in HDMI 1.3? HDMI 1.3 and 1.4 have the same bandwidth, so it may seem odd that HDMI 1.3 doesn’t list support for 1080p 120 Hz. Back when the public didn’t have access to the HDMI 1.4 Specification, this was often used to support the hypothesis that HDMI 1.4 imposed a 60 Hz limit at 1080p. After all, HDMI 1.3 already had the same bandwidth but didn’t list support for 1080p 120 Hz; while people couldn’t check HDMI 1.4, why would anything have changed? And besides, we had plenty of examples of HDMI 1.4 monitors like the VG248QE which were limited to 60 Hz over HDMI, so it seemed a reasonable assumption. Of course, with access to the HDMI 1.4 Specification, this assumption is easily debunked, as 1080p 120 Hz is indeed listed as a supported format (in both the 2D and 3D sections). However, that does still leave the question as to why HDMI 1.3 didn’t list support for it, even though it has the same bandwidth as HDMI 1.4. The answer has to do with where these supported formats come from. The HDMI specification declares this list of formats with predefined standardized timing parameters, but it doesn’t actually define the specific timings itself. It refers to a completely separate set of standards, called CTA‑861 (formerly known as CEA-861). 1080p 120 Hz was not added to CTA‑861 until revision E, published in 2008. HDMI 1.3, published in 2006, only included formats defined in CTA‑861-D. HDMI 1.4, published in 2009, was updated to include the new standardized timings defined in CTA‑861-E, including 1080p 120 Hz. The HDMI standard has numerous versions, which introduce new features and capabilities. To support a feature, the graphics card and display hardware must both support the necessary version. The HDMI cable design is the same for all versions and does not affect feature/version support. (The only exception to this is the inline Ethernet feature, which requires an "HDMI with Ethernet" type cable). All HDMI devices are compatible with each other regardless of version, but the capabilities will be limited to the lowest version between the two. For example, if your laptop has HDMI 2.0, but your monitor only has HDMI 1.4, you will be limited to the features and capabilities of HDMI 1.4. HDMI cables don't affect feature support. Things like HDR, FreeSync, 3D, and inline audio will work on any HDMI cable. It doesn't matter which version the feature was introduced in or when the cable was made. The cable design has not changed from version to version. The only exception is inline Ethernet, which requires an "HDMI with Ethernet" cable which has a slightly different wiring. Maximum bandwidth (resolution and refresh rate) does depend on the manufacturing quality and length of the cable. Higher resolutions and refresh rates require more bandwidth, and therefore a higher quality cable. However, there is no need to buy the most expensive "high quality cable" you can find. HDMI cables have certifications that guarantee certain levels of bandwidth. High Speed HDMI cables have been tested to handle at least 10.2 Gbit/s. This is sufficient for at least 1080p 144 Hz or 1440p 75 Hz. Pretty much any HDMI cable can handle this. Premium High Speed HDMI cables have been tested to handle at least 18.0 Gbit/s. This is sufficient for at least 1080p 240 Hz, 1440p 144 Hz, or 4K 60 Hz. Many normal High Speed HDMI cables will also be ok at these speeds, but it is not guaranteed, especially at longer distances (see Section 5.3.4). Just get a cable with a high enough rating and you're good to go. The "with Ethernet" cable has a slightly different wiring, and is required for the inline Ethernet feature (which is very rarely supported by devices anyway). Other than that, the difference does not matter. Both types of cable are compatible with all HDMI devices. All other features work on both cable types. However, what the cable does affect is the maximum bandwidth. Although the wiring and feature support is the same for all cables (other than the normal and "with Ethernet" distinction), the manufacturing quality of the cable can affect the maximum bandwidth of the connection. Higher resolutions and refresh rates require more bandwidth, and therefore higher quality cables. To protect from overpriced "high quality" cable sharks, the HDMI creators have established a certification system for HDMI cables. All HDMI cables (either normal or "with Ethernet") also have an associated rating for how much bandwidth they can handle. Ultra High Speed HDMI Cables 48.0 Gbit/s Basically everything As of August 2018, the HDMI CTS version 2.1 has not been finished yet, so no cable can be legitimately certified as an Ultra High Speed HDMI cable. Any cables that claim to be are fake. While the HDMI cable can affect bandwidth, it is important to be aware that HDMI ports also have a maximum bandwidth, based on the version of the port. This applies to both the video source device and the display. The cable is not the sole determiner of how much bandwidth the connection will have. Since all cables are compatible with all HDMI devices, there is no technical disadvantage to a higher-end cable, but there is no advantage either. While you could make a future-proofing or a "might as well" argument for them, just be aware that using a cable rated beyond what your equipment allows serves no immediate purpose. If your GPU or your monitor only has an HDMI 1.4 port, then the connection will be limited to 10.2 Gbit/s at most. Using a cable rated for 18.0 Gbit/s won't "upgrade" the connection to a higher speed or give any other kind of advantage compared to a 10.2 Gbit/s-rated cable. Using "HDMI versions" for cables is not technically accurate and should be avoided. High Speed HDMI cables are tested to handle bandwidth of at least 10.2 Gbit/s. Since HDMI 1.4 allows a maximum of 10.2 Gbit/s, people often call these cables "HDMI 1.4 cables". However, HDMI versions 1.3, 1.3a, 1.4, 1.4a, and 1.4b all have a maximum of 10.2 Gbit/s, so any of those names would also equally apply. HDMI cables are not designed specifically for one version or another. Using a specific version like "HDMI 1.4 cable" implies that this is different from an "HDMI 1.3 cable" or an "HDMI 1.4a cable", when in reality these terms all refer to the same thing: a High Speed HDMI cable. It also misleads people into thinking that the cable is involved in "supporting" the features introduced in that version. For example, people believe that you need an "HDMI 1.4 cable" for 3D, and that an "HDMI 1.3 cable" won't work. In reality, the cable does not affect feature support, only bandwidth, which is why they are categorized by bandwidth alone. Labeling HDMI cables with a "version number" in fact has been explicitly banned by HDMI Licensing, the creators of the HDMI standard. The same thing is true of Premium High Speed HDMI cables, tested to handle at least 18.0 Gbit/s; people like to call them "HDMI 2.0 cables", but this should be avoided. It misleads people into thinking that the cable is related to feature support. For example, people think that HDMI 2.0 features like HDR won't work on an "HDMI 1.4 cable". Premium High Speed HDMI cables are not a requirement for using HDMI 2.0 features, and there are no separate "HDMI 2.0" or "HDMI 2.0a" or "HDMI 2.0b" cables. These terms all refer to the same thing, a Premium High Speed HDMI cable. When HDMI 2.0 first launched, the creators of HDMI stated that any existing cable with a High Speed certification would be able to handle the increased 18.0 Gbit/s bandwidth (i.e. 4K 60 Hz). This statement is, in fact, still present on the HDMI.org website today. However, this is unfortunately not always true (for example, demonstrated here). While most High Speed HDMI cables do work at 18.0 Gbit/s, especially shorter ones (in the 5-meter range), it is not guaranteed that any High Speed cable will handle that speed. Long cables in particular are less likely to be able to handle the full speed. In response to this, the HDMI Forum has created the Premium HDMI certification program, which actually tests cables for proper operation at 18.0 Gbit/s. These cables are known as Premium High Speed HDMI cables. The HDMI 2.1 specification was published at the end of 2017. This contains the information manufacturers need to start designing HDMI 2.1 hardware. HDMI 2.1 also introduces a new cable certification category ("Ultra High Speed HDMI cable") to handle the new 48 Gbit/s maximum bandwidth of HDMI 2.1. However, as of August 2018 the HDMI 2.1 CTS (compliance test specification) has not yet been completed. Therefore, it is currently impossible for any cable or device to be "HDMI 2.1 compliant", as there is nothing for them to comply with yet. Any product claiming to be an "Ultra High Speed HDMI cable", or otherwise claiming to be certified for HDMI 2.1 compliance, is a fake. It is unlikely that we will see HDMI 2.1 products until the end of 2018 at the earliest. The release of the specification is when engineers BEGIN designing new products, it typically takes a year or longer to see products that implement new standards appear on the market. When Will 2.1 Be Implemented? When Will Products Be Available? There are no products yet which implement any of the new features or use any of the new bandwidth, resolution, etc, of 2.1. The specification was published November 28, 2017; that's a sort of a "go" signal for developers of source, display and other devices, but it will take quite a while before products implementing 2.1 are on the market. In fact, at the moment even if someone were to come up with a new device implementing 2.1, there'd be no way to certify it, because HDMI has published only the master specification document. In order for products to be evaluated for conformity to 2.1, there will need to be Compliance Testing Specifications, and these are not likely to be out until deep into 2018. ALL INFORMATION IN THIS SECTION ASSUMES THAT YOUR MONITOR SUPPORTS 120+ HZ OVER HDMI. 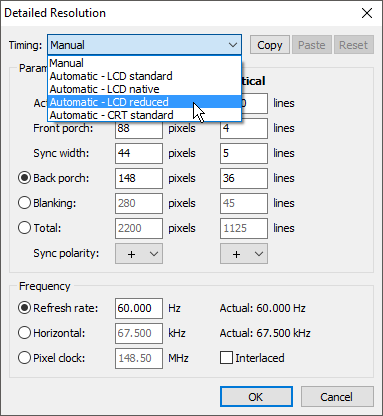 MOST MONITORS ARE LIMITED TO 60 HZ OVER HDMI, AND NONE OF THESE OPTIONS WILL WORK IN THAT CASE. If your computer has a DisplayPort output, you can use either a passive or an active adapter. Passive DP to HDMI adapters can be used, but not all of them are the same. Most retailers don’t label them "Type 1" or "Type 2", but you can identify Type 2 adapters by looking for adapters with "4K support". For speeds beyond 120 Hz at 1080p, you need a DisplayPort to HDMI 2.0 active adapter. These will support up to 240 Hz at 1080p or 144 Hz at 1440p. These adapters are also compatible with HDMI 1.4 monitors, and will work up to 144 Hz at 1080p or 75 Hz at 1440p in that case (assuming the monitor supports those speeds over HDMI). If your computer has a DVI port, you can use a standard inexpensive DVI-HDMI passive adapter/cable up to 144 Hz at 1080p or 60 Hz at 1440p. If a display supports 1080p 120+ Hz over HDMI, than a simple DVI-HDMI passive adapter can be used to connect from a DVI graphics card to the HDMI display, up to 144 Hz at 1080p. This only works from DVI source to HDMI display; the same adapter will be limited to 60 Hz at 1080p if used from an HDMI source to a DVI display. So why do these adapters work up to 144 Hz in this specific situation? To explain this, first you need some background on the relationship between DVI and HDMI, and how passive adapters function. For those who don't know, HDMI is effectively an extension to the DVI standard, not an original design. The basic operation, design, and signaling protocols of HDMI are all inherited from the DVI standard. The HDMI connector is a redesigned Single‑Link DVI-D connector with a slimmer shape (similar to how a Mini DisplayPort connector is a smaller but electrically identical version of the full-size DisplayPort connector). There is, in fact, a "Dual‑Link HDMI" connector defined in the HDMI standard (§4.1.3 p10–13), but it was never used in any commercial products. In Single‑Link DVI and HDMI cables, three pairs of wires used for sending video data. DVI and HDMI (versions 1.0–1.2) allow speeds up to 1.65 Gbit/s per pair (4.95 Gbit/s total with 3 pairs). This is enough for up to 60 Hz at 1080p. To add additional bandwidth however, these standards diverge in design. DVI adds an additional 3 pairs of wires (now 6 pairs total) for video data. On each pair, the data is still sent at the same rate (1.65 Gbit/s per pair), but the total bandwidth is now 9.90 Gbit/s (6 × 1.65 Gbit/s). Since it uses additional wires, it needs a different connector with more pins, which is the Dual‑Link DVI connector. HDMI 1.3 adds a similar amount of bandwidth, but instead of increasing the number of wires, it accomplishes it by increasing the signaling rate on the existing wires, from 1.65 Gbit/s to 3.4 Gbit/s per pair (total 10.2 Gbit/s for 3 pairs). Now, keeping that in mind, it is also important to understand how passive adapters function. They do not actually "do" anything. They only work because the video output ports on source devices have the ability to send multiple types of signals. For example, the DVI output ports on graphics cards are not just limited to sending out DVI signals, they are also capable of transmitting HDMI signals and (optionally) VGA signals. The only problem is that the DVI port can't physically morph into an HDMI port to allow you to plug HDMI cables in, which is why the passive adapter is required. It is only necessary for making the physical connection, it doesn't "do" anything else, the signaling is handled by the source device. When you connect a passive adapter from a DVI graphics card to an HDMI display, the adapter doesn't need to "convert" a 6 × 1.65 Gbit/s Dual‑Link DVI signal into a 3 × 3.4 Gbit/s HDMI signal. Instead, the DVI port switches to HDMI mode and starts sending out 3 × 3.4 Gbit/s across the Single‑Link pinout, just like an HDMI port. The original signal coming out of the DVI port is already in the Single‑Link HDMI format. So even though 1080p 144 Hz requires Dual‑Link DVI, it is still possible with a Single‑Link DVI to HDMI adapter, because the port is not sending a DVI signal, it is sending an HDMI signal, which does allow 1080p 144 Hz over a Single‑Link connection. Incidentally, because the original signal is HDMI, other features such as inline audio will also work over a DVI-to-HDMI connection. Lastly, it is important to note that this is only true in one direction. While output ports can send multiple types of signals, input ports are usually only capable of receiving their native format. DisplayPort inputs can only receive DP signals, DVI inputs can only receive DVI signals, etc. So, if you use the reverse configuration, an HDMI source to a DVI display, the opposite will happen; the HDMI output port will operate in DVI mode, and you'll be limited to Single‑Link DVI capabilities, 1080p 60 Hz with no audio. Since DVI signals are being used, Dual‑Link would be required for 144 Hz in that case. The HDMI port does not have enough pins to send Dual‑Link signals since it is only based on the Single‑Link DVI connector, and the DVI input ports on monitors generally will not accept the higher-speed HDMI signals (> 1.65 Gbit/s per pair), so the connection is limited to 3 × 1.65 Gbit/s, the speed of a normal Single‑Link DVI connection, 1080p 60 Hz. The DVI port on your graphics card essentially acts as a passthrough for the card’s HDMI controller when using a DVI to HDMI adapter, so the maximum capabilities are the same as whatever HDMI version the card has. If your computer has a video-capable USB Type‑C port, you can also use a USB Type‑C to HDMI adapter. These adapters are available in multiple options, some with only HDMI 1.4 support (up to up to 144 Hz at 1080p or 75 Hz at 1440p), and some have HDMI 2.0 support (up to 240 Hz at 1080p or 144 Hz at 1440p). If you haven't tried to set the refresh rate to anything else, make sure you do that. Not all monitors set themselves to 120+ Hz automatically. 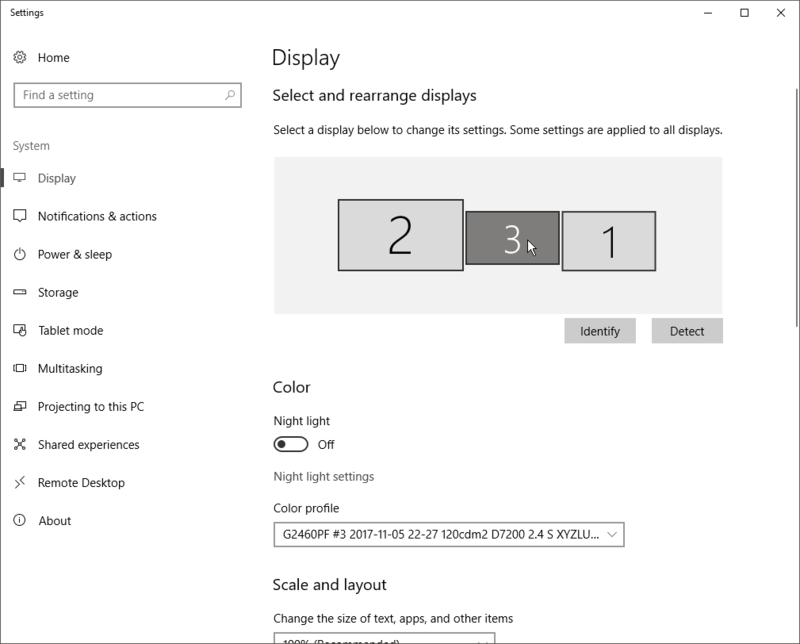 The instructions for setting the refresh rate in Windows 10 are in Section 6.1.1 below. If you have tried but there are no options above 60 Hz, see Section 6.1.2. 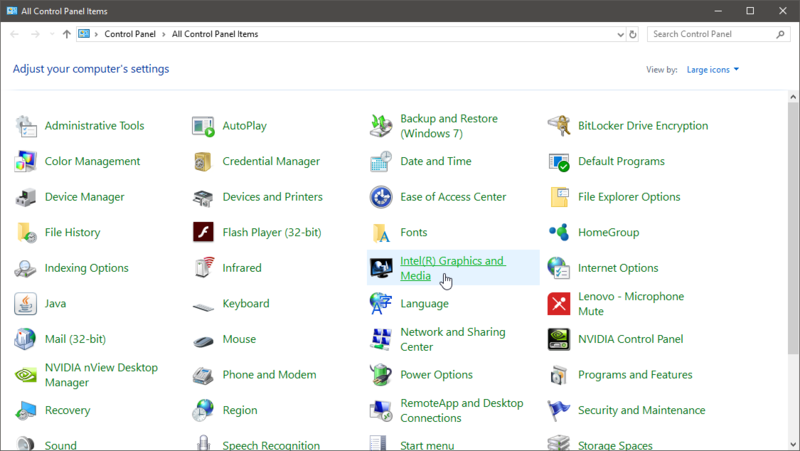 If you just recently reinstalled your OS, make sure GPU drivers are installed and that you have restarted the computer since installing them. The next instruction will cause the screen to turn black for a moment. If it does not come back, hit the Escape key or wait 20 seconds. Make sure you are connected with the correct cables. Carefully read the sections of this guide that deal with the cables or adapters you are using. 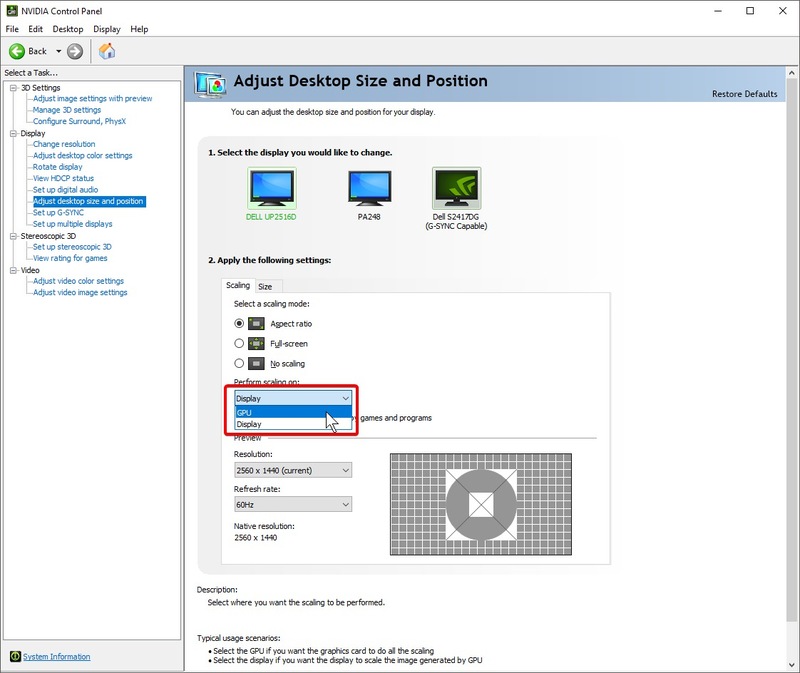 If you are trying to set the refresh rate from the NVIDIA control panel, scroll down the resolution list and make sure you select from the "PC" section if the maximum resolution is listed there. 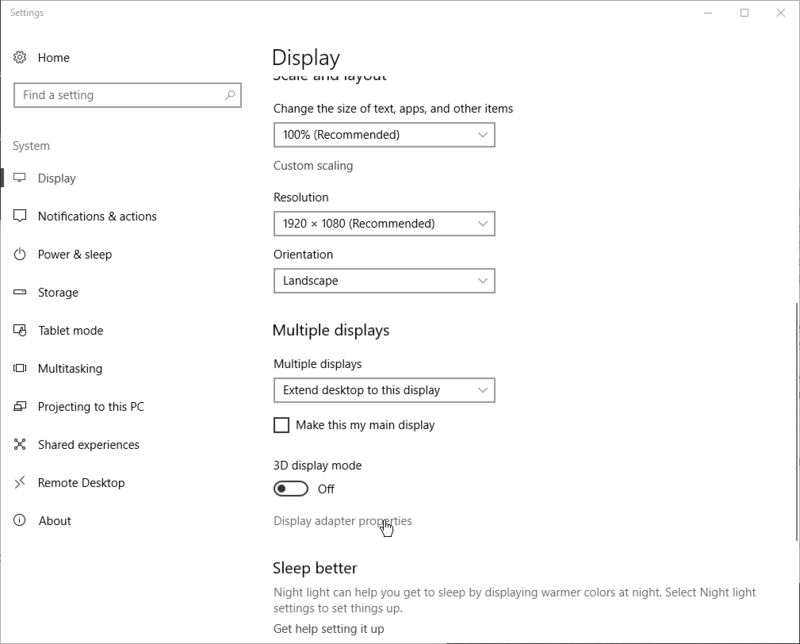 If you are connected with DisplayPort, check the monitor's menu for a DP version option and set it to the highest available. If you can’t find any such control, read the monitor manual, sometimes it’s a hidden option. 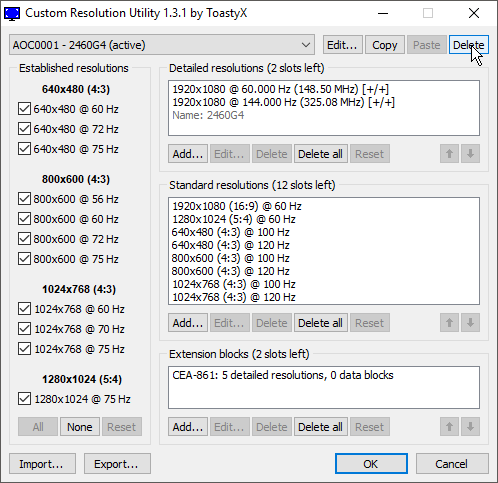 If there are still no options above 60 Hz, try setting a custom resolution, as described in Section 6.3. The Blurbusters UFO test is commonly used to check high refresh rate monitors. This test does not always work properly since it depends on browser support. It is recommended to use Firefox for the UFO test. 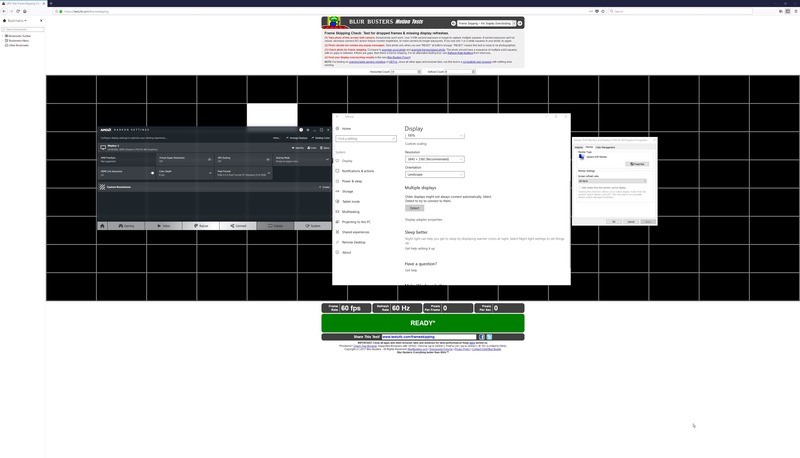 Chrome does not usually work above 60 Hz. Make sure to follow all onscreen instructions, including setting the high refresh monitor as your primary display and closing all other tabs and windows. If there are no options besides 3D Settings, then you are most likely using a laptop with NVIDIA Optimus enabled. 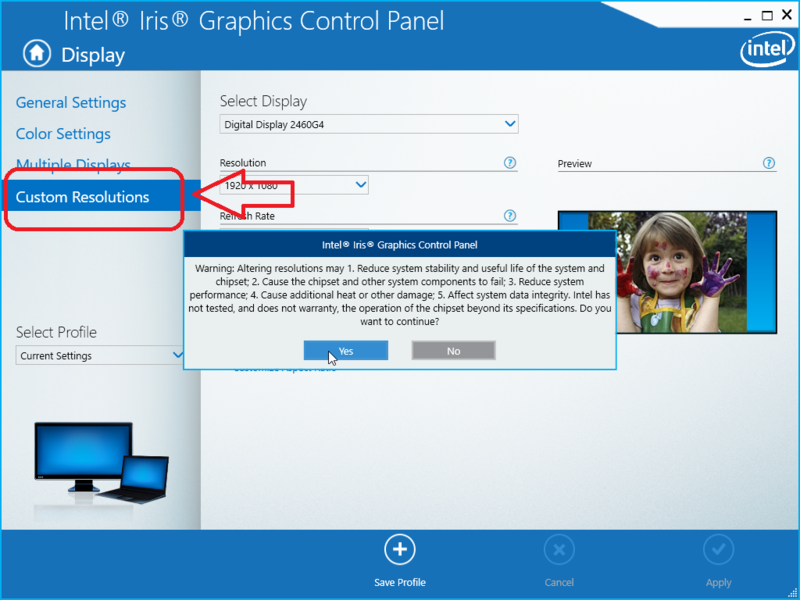 You should set a custom resolution from the Intel control panel instead, using the instructions from the Intel section below. Alternatively you can reboot and check the BIOS for an option to disable NVIDIA Optimus/switchable graphics). If the Customize button is still greyed out, make sure you have no pending changes. If there are "Apply / Cancel" buttons in the bottom right corner of the NVCP, that means you have pending changes. 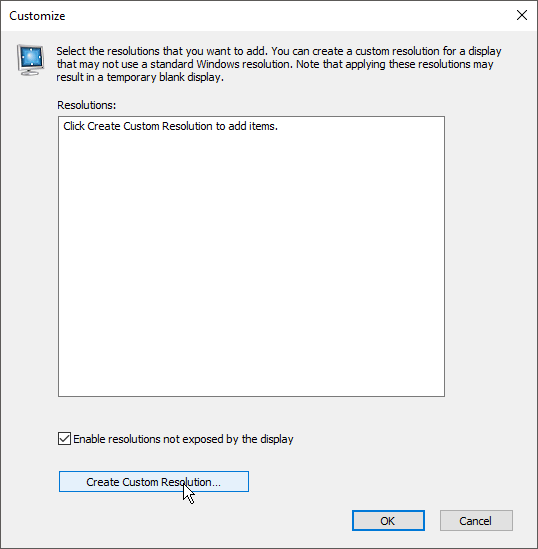 You need to either apply or cancel them before setting a custom resolution. 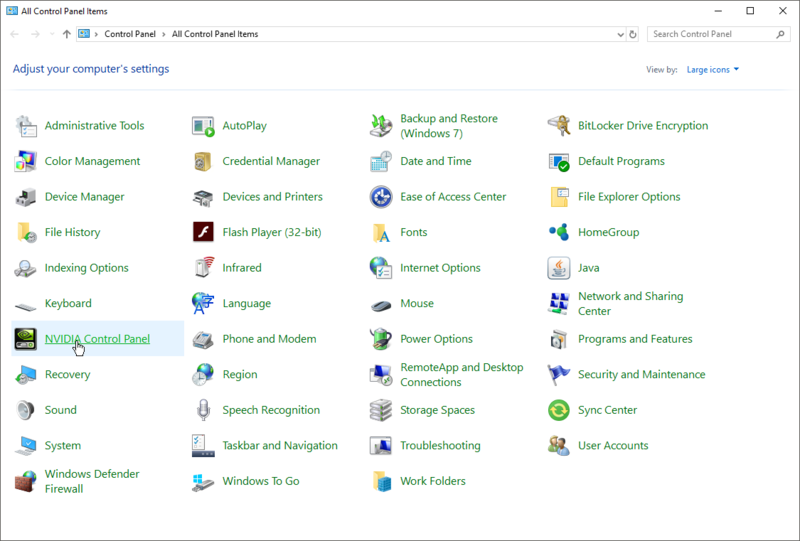 The setting you just created will now appear as an option in Windows. 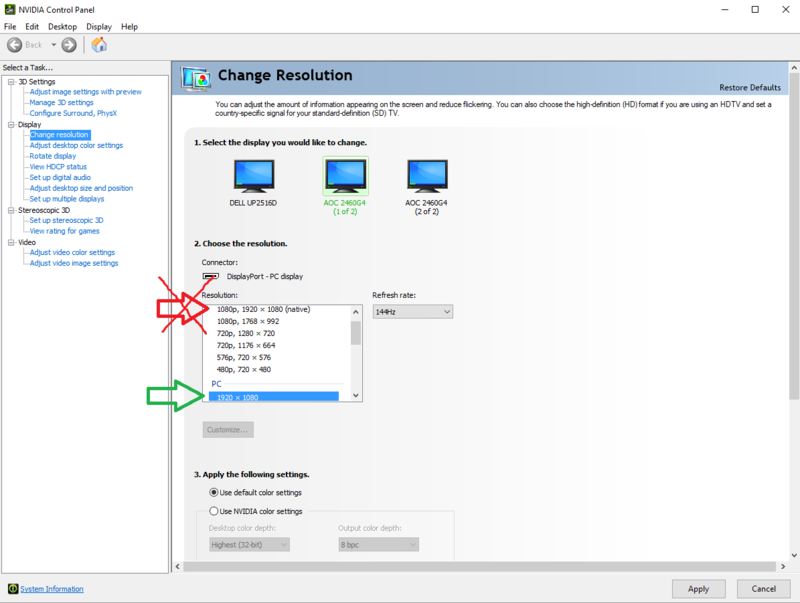 Change the refresh rate through Windows Settings as explained in Section 6.1.1. The new format should now appear as an option in Windows (you may have to restart the computer). Set the refresh rate through Windows according to the instructions in Section 6.1.1. 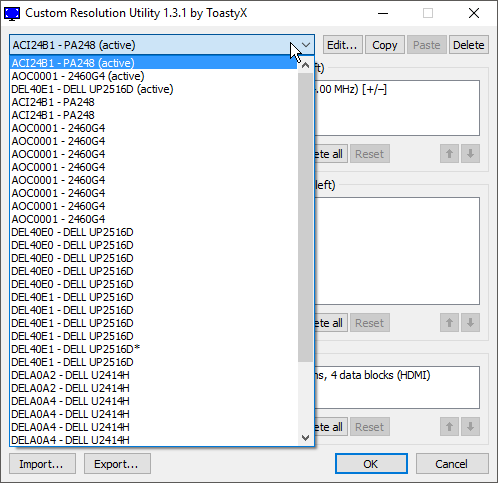 Download the Custom Resolution Utility by ToastyX here and extract the contents to a new folder. Only four detailed resolutions are allowed (or 3 plus a name). If there are already 4 resolutions, you will have to remove one of them. Also if you fill up all 4 slots, just be aware that the monitor’s name will no longer be detected since there is no room for it, so it will show up as "Generic PnP Monitor". This doesn’t affect anything though. 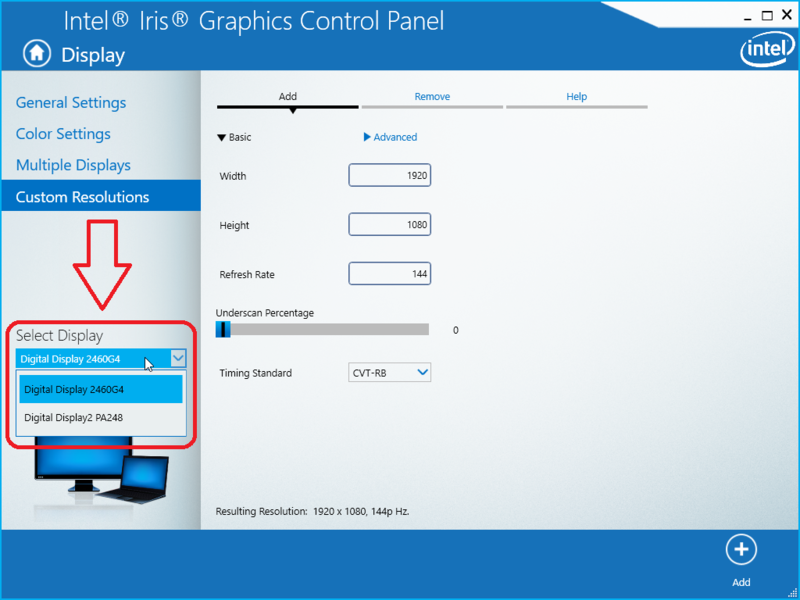 The new format should now be available as an option in Windows, change the refresh rate as described in Section 6.1.1. 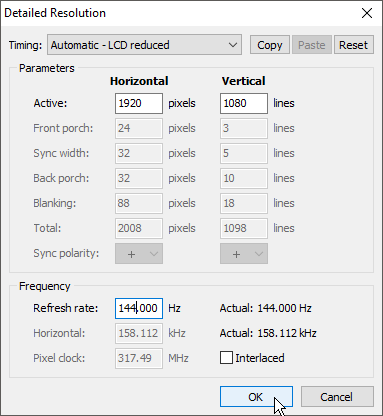 Options beyond 60 Hz will not appear normally, the user must set custom resolutions. Note: Tom's Hardware review states that this monitor supports FreeSync over HDMI. This is incorrect. This is NOT a typo of "VG248QE". The VG248QE is a completely different monitor which is much older and is limited to 60 Hz at 1080p over HDMI. "R" variant has support for HDR and FreeSync 2, "non-R" variant supports SDR and standard FreeSync only. 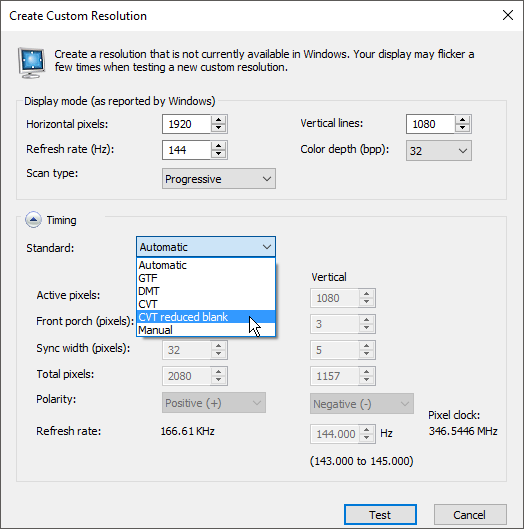 Options beyond 60 Hz will not be appear normally, the user must set custom resolutions. First of all this seems like a great guide in which has been put a lot of work. Im not sure if you will read this but I kind of just want your confirmation if I understood this right because English is not my native language. I want to buy a monitor to play on 120HZ or 144HZ and connect it with HDMI to my Laptop which has 60HZ. I am using the "Acer Nitro 5 (AN515-52-7840)" and as far as i know it has a 1.4 HMDI Port and the gpu gtx1050ti. Does this mean that i can play games on a new monitor with 120HZ or 144HZ if i buy a monitor which supports atleast HMDI 1.4 and 144HZ with HDMI? Yes, it will work, as long as the monitor supports it. Unfortunately you can't. Most monitors cannot have their firmware updated in the field. Thanks so much for clearing up the misinformation about HDMI compatibility. It's been a struggle to find solid info on it and this guide is perfect. Just one question: I can't seem to find what version my laptop's HDMI port is, but I'm fairly sure it's 1.4+. Will the HDMI version of my laptop's HDMI port affect what kind of monitor I need to get (depending on whether it's 1.4 or 2.0, for example)? Would all of the 144hz over HDMI monitors you've listed work with either HDMI 1.4 or HDMI 2.0? HDMI 2.0 isn't required, HDMI 1.4 is sufficient for 1080p 144 Hz. 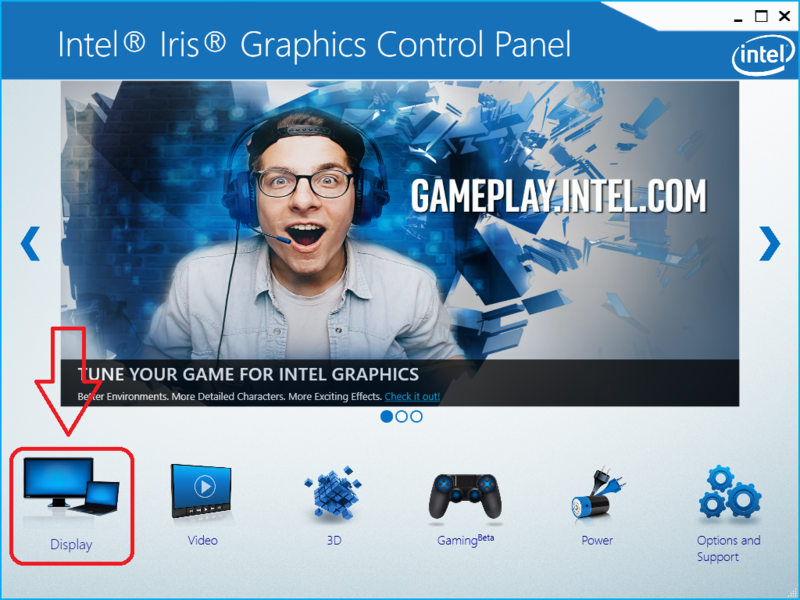 Some older Intel integrated graphics have limitations which will only let you get ≈100 Hz at 1080p but if you've got a dedicated GPU you should be ok. If a DVI cable or adapter only claims to support a maximum of 1920 × 1080 or 1920 × 1200, then it is a Single‑Link DVI cable/adapter.■ If a DVI cable claims to support 2560 × 1440 or higher, then it is a Dual‑Link DVI cable. as it says it is an active one and supports 4K....but still only 60hz at 1080p so is this SL or DL? Ideally i want an active adapter that can run 1680x1050@120Hz but the ones I see cost at least £60 or more. says active but limited to 60hz and only a few quid. Also do you know if the new graphics cards that only have displayports still need an active adapter and 2 passive to run 3 monitors (i'm on eyefinity)? It's a Single-Link adapter. It supports 4K via the HDMI protocol (high speed 10.2 Gbit/s Single-Link signals) if you attach a DVI to HDMI adapter on top of it. 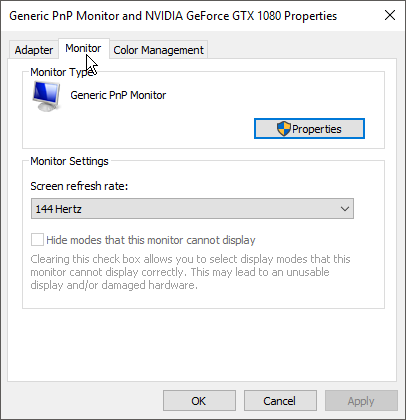 I got the monitor for testing a while ago, it does not support FreeSync over HDMI. I tried installing various beta drivers on the internet. The Tom's Hardware review states they had some kind of updated firmware that enabled it, I contacted AOC support to ask if this was true, the support rep said he'd ask an engineer but I never got a response after that. I also tried adding a FreeSync range through the EDID manually but it did not work, even with a small range like 60-120 Hz or 60-90 Hz. When I purchased the monitor it was already over a year after the Tom's Hardware review, so if there is some kind of firmware that enables it, it does not seem like it is being distributed in production monitors, at least in the US. 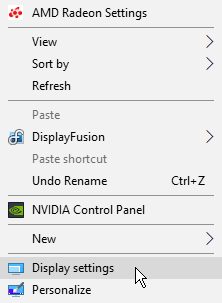 I've tried creating a custom resolution in the Nvidia control panel as well as using the Custom Res Utility, following the directions exactly. Every time, my monitor just goes black, then switches back and forth between sleep and black screen a few times until it reverts automatically. I dragged the box over to my other monitor so that I could hit okay so it wouldn't revert, but it just kept cycling through the sleep/black screen every few seconds until I gave up and reset it to default. What are my options? The manual doesn't specify exactly that it supports 1080p 144 Hz over HDMI; it says vertical refresh frequency on HDMI goes up to 144 Hz, but that doesn't necessarily mean it is supported at full resolution (for example some monitors list up to 75 Hz but they are capped at 60 Hz at full resolution, 75 Hz only is available at low resolution like 1280×1024). 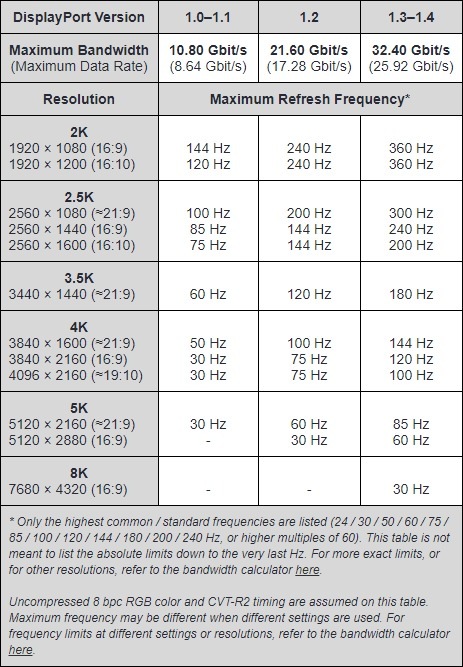 In those cases, sometimes the horizontal frequency will be a giveaway, as it may be too low to support full resolution at 144 Hz, but in this case the VX2458-mhd lists a maximum of 180 kHz which is more than enough to fit 1080p 144 Hz. Even with that, it's still technically possible that it doesn't support 1080p 144 Hz (by supporting only a really low horizontal resolution at 144 Hz), but that would be a quite bizarre limitation I think, it is very unlikely. So I am fairly confident it supports 1080p 144 Hz, but cannot be absolutely certain based on the specs in the manual (a maximum TMDS clock would confirm it, but that spec is just listed as "TBD" in the manual; I guess someone forgot to fill it in), and since there are also no reviews that can confirm it, that is why I have put the note that it is not specifically claimed in the manual (only indirectly inferred). More of a note for myself than anyone else, I don't expect most people to really know what the note means xD but I will update it if I see some reviews or the manual is updated. Not much unfortunately, sometime monitors just will not accept custom resolutions. You can try making sure that GPU scaling is on to try to avoid monitor compatibility problems, but it doesn't always work. An HDMI to DisplayPort adapter will not work with FreeSync, no. The G2590PX I think is a good option. The 24.5" panel it uses is a newer panel as well, which supposedly has improved image quality compared to the older panels most 24.0" 144 Hz monitors use. Haven't tested any myself though. My laptop - Dell g7 15 7588 (2018) , it has Type-C Thunderbolt 3 and HDMI 2.0 (according to the Dell website). The external monitor in question is - 215$ prime ,ViewSonic XG2402 24 Inch 1080p 1ms 144 Hz , as many sources claim is one of the best budget (under 250$) option. It offers DisplayPort and HDMI connectivity. I spent a lot of time researching and learning, so, should I use laptop's Thunderbolt 3 output with (Plugable USB C to DisplayPort Adapter), which was mentioned in this topic above? HDMI 1.4 , according to what I read, it can offer 144 ghz at 1920x1080? P.S. Dell g7 15 has 6gb 1060 max-q dedicated graphics card, I am not sure if it supports 144 ghz external monitors, I couldn't find any info on that. For shopping advice it may be best to start your own thread, so more people will see and reply, and so that this thread does not become full of recommendations that will eventually become outdated.